Please help us to protect the environment and the marine life of Zanzibar by following some very important rules. If you like to do a dolphin tour make sure your boat driver does not chase them, because this causes stress for the dolphins. The result is a fall in the birth rate. Dolphins like to play, but they should decide themselves if they like to swim with humans. Please don’t step on the corals, since they are very fragile, they grow extremely slowly and certain marine life depends on them! Also don’t take them - this is strictly prohibited. Corals are strongly endangered worldwide because of the growth of tourism. Please never take the starfish out of the water! 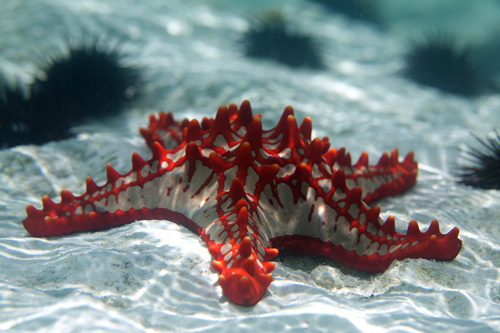 The sensitive capillary system of the starfish fills with oxygen instead of water, and when they are back in the water, due to the pressure ratio they can no longer press the oxygen out of the capillary system. They painfully pass away. If you book a snorkelling trip with a beach boy please keep him from taking them out. Please don’t endanger the health and life of the beautiful sea dwellers for some holiday snaps! By June 2019 Tanzania is to enforce the total ban on the use of plastic bags. With six tons produced locally and another 170 tons imported per year, the environmental disaster is huge. Tanzania joins other countries such as Zanzibar, Kenya and Rwanda. If you bring plastic bags from your home country please make sure to take them back home.